Our Products >> 0335 RS60 Grader Blade 5 Ft.
0335 RS60 Grader Blade 5 Ft.
Model 0335 RS60 optional grader blade assembly for models 3105 and 3115 York RS 5 ft. wide landscape rakes as well as TA2 5 ft. rakes. 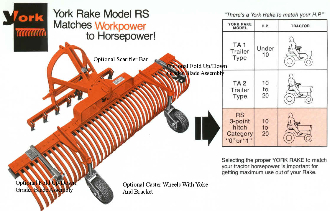 Includes grader blade with brackets that clamp to landscape rake frame. Blade flips down in front of rake teeth when in use and up out of way when not in use.